Radiation Oncology is the use of high-energy radiation to treat cancer. It is used to destroy the cancer cells’ ability to reproduce. Why is the Radiation Therapy for Cancer radiology procedure Performed? Radiation Therapy for Cancer is performed to destroy the cancer cells' ability to reproduce; then, the body naturally gets rid of these cells, by damaging their DNA. This inhibits the cancer cells’ ability to grow and divide. There have been no recent advances to replace Cancer Treatment using Radiation Therapy. The cost of the Cancer Treatment using Radiation Therapy depends on a variety of factors, such as the type of your health insurance, annual deductibles, co-pay requirements, out-of-network and in-network of your healthcare providers and healthcare facilities. It is normal for a patient to feel uncomfortable and confused with a sudden inflow of information regarding the Radiation Therapy for Cancer and what needs to be done. How does the Radiation Therapy for Cancer radiology procedure work? How is the Radiation Therapy for Cancer radiology procedure Performed? Radiation Therapy for Cancer is generally performed as an outpatient procedure, at a hospital. Depending on the Cancer Therapy using Radiation procedure adopted, the patient may receive treatment, 5 days a week, for about 2-10 weeks. Each session may last anywhere between 10-60 minutes. Depending on the outcome of the Cancer Treatment using Radiation Therapy, the radiology oncologist interprets the results. A physician will request your consent for Radiation Therapy for Cancer using an Informed Consent Form. What are the Limitations of the Radiation Therapy for Cancer radiology procedure? What is Radiation Therapy for Cancer? What is to be expected during the Radiation Therapy for Cancer radiology procedure? No anesthesia is given during Cancer Treatment using Radiation Therapy. There is no blood loss involved during Cancer Treatment using Radiation Therapy. What are the possible Risks and Complications during the Radiation Therapy for Cancer radiology procedure? What Post-operative Care is needed at the Healthcare Facility after the Radiation Therapy for Cancer radiology procedure? There is no postoperative care necessary after Radiation Therapy for Cancer, at the healthcare facility. 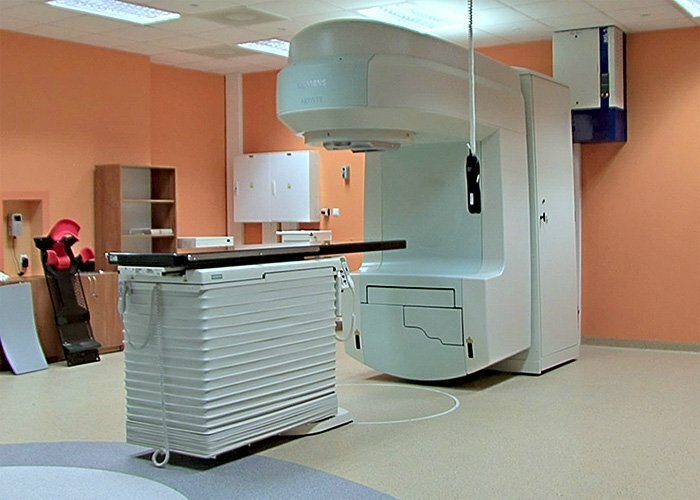 What is to be expected after the Radiation Therapy for Cancer radiology procedure? Do contact the physician, if the side effects of Radiation Therapy for Cancer treatment become too painful. What Post-Operative Care is needed at Home after the Radiation Therapy for Cancer radiology procedure? Generally, there is no postoperative care necessary after the Radiation Therapy for Cancer, unless the side effects are severe. How long does it normally take fully recover, from the Procedure? Generally, the patient needs no recovery time after the Radiation Therapy for Cancer. However, in some cases the side effects of the radiation treatment may be severe. No tissue is extracted from the patient during a Radiation Therapy for Cancer. Who will you receive a Bill from, after the Radiation Therapy for Cancer radiology procedure? The patient is advised to inquire and confirm the type of billing, before the Radiation Therapy for Cancer treatment procedure is performed.